Japan’s H-IIA rocket soared to its fourth success of the year on Saturday, deploying the third satellite in the country’s Quasi-Zenith Satellite System for navigation services augmentation in a fast-paced effort to complete the four-satellite constellation before the end of the year for full service capability by mid-2018. Operated from Geostationary and highly specialized Tundra orbits, the system delivers a twofold service to improve the availability of navigation services by placing satellites at high-elevation over the Japanese islands and to enhance navigation accuracy by delivering augmentation messages to equipped GPS and Galileo receivers. 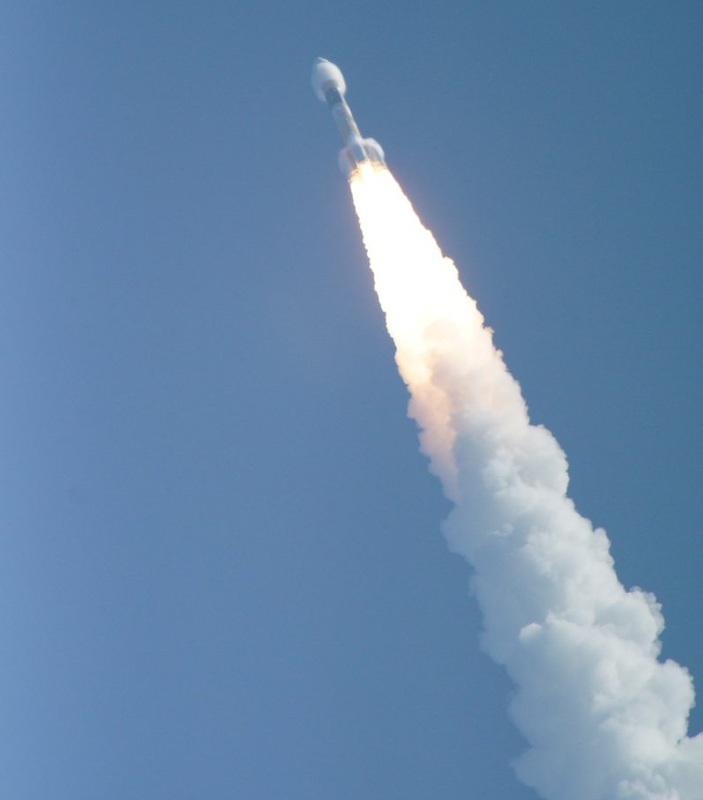 Blasting off with the heaviest member of the constellation, H-IIA flew in its most-powerful 204 configuration on Saturday, featuring four Solid Rocket Boosters to deliver the initial kick needed to send the craft on its way. QZS-3, also known as Michibiki-3, is the sole Geostationary Satellite of the constellation – tasked with providing a constant navigation beacon in the sky over the broader Asia-Pacific Region, delivering navigation augmentation messages for accuracy enhancement in aviation, scientific application and future self-driving automobiles. 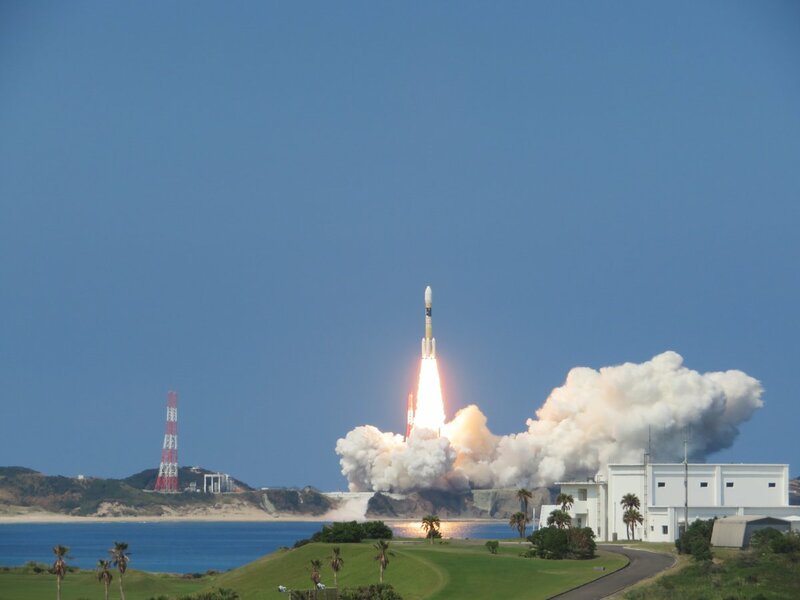 H-IIA blasted off from its sea-side launch pad at the picturesque Tanegashima Island on the southern tip of Japan at 5:29 UTC on Saturday, 2:29 p.m. local time – leaping off the ground with a thrust exceeding 1,000 metric-ton-force. Screaming away from the Japanese Islands, H-IIA was headed south east, dropping its boosters just after two minutes into the flight and continuing to fire its cryogenic core stage for six and a half minutes before handing over to the single-engine second stage for an initial boost into Low Earth Orbit. The second stage re-started after a passive coast phase to significantly boost the high point of the orbit and loaded springs pushed QZS-3 on its way 28 minutes and 40 seconds after liftoff, arriving in a standard Geostationary Transfer Orbit. 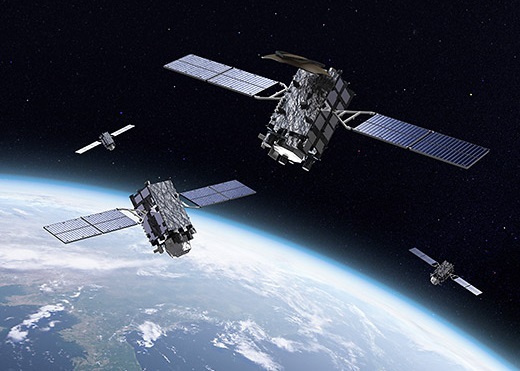 2017 is a very busy year for the Quasi-Zenith Satellite System (QZSS) with all three operational satellites launching within one calendar year to join the initial pathfinder craft that launched back in 2010 to establish the fully operational satellite constellation comprising one satellite in GEO and three satellites at the proper spacing in inclined Tundra orbits to have one craft at high elevation over Japan at any given time. The Quasi-Zenith Satellite System takes a unique spot in the world’s satellite systems in that it augments a foreign constellation in twofold fashion – a) it acts as a member of the Global Positioning System and transmits GPS-compliant navigation signals to increase its availability by placing a GPS mimic at high elevation over Japan, and b) it relays augmentation signals generated on the ground to specially-equipped receivers to improve GPS and Galileo navigation accuracy through the correction of clock drifts and atmospheric signal distortion. Traditional navigation augmentation systems like the U.S. Wide Area Augmentation System widely used in aviation only deliver augmentation signals but the case for Japan was special in that not only an accuracy improvement was needed due to the fact that the country’s urban canyons were often blocking a direct line of sight from a ground receiver to a sufficient number of GPS satellites to allow for position calculation. 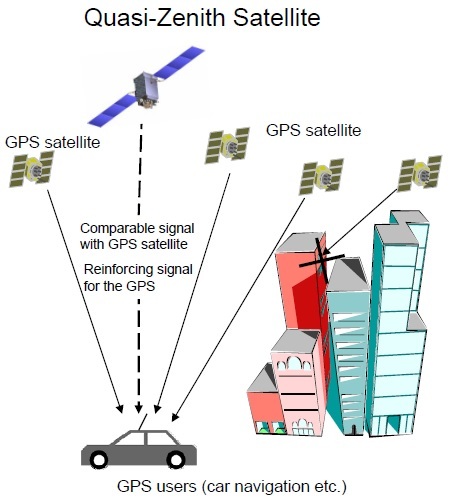 To increase GPS availability between tall buildings, an additional GPS source at very high elevation was needed – raising the odds for sufficient satellites being available to obtain a position fix. 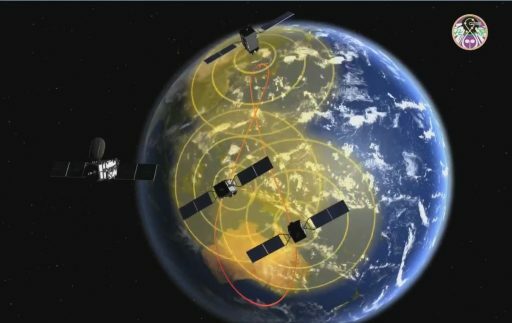 This is realized by placing three GPS-transmitting QZSS satellites into specialized Tundra orbits that allows one satellite to be at very high elevation at any time, being treated by ground receivers like any other member of the GPS constellation. The accuracy enhancement is realized independently through specialized GPS/Galileo messages delivering correction information. 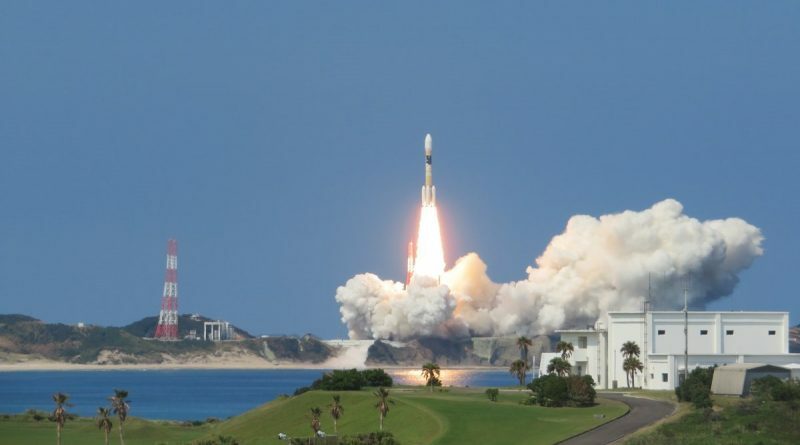 The QZSS program started out back in 2002 when development work was started by an industry consortium which later fell apart with JAXA taking over work on the project. Clearance for use of the GPS navigation bands & signal architecture was given by U.S. authorities, allowing the project to move to the launch pad in 2010 with a pathfinder satellite. QZS-1 went through extensive signal characterization and fine-tuning before beginning to deliver services in 2011 to validate the working principle of QZSS – demonstrating service availability enhancement and increasing navigation accuracy by a factor of 2.5. 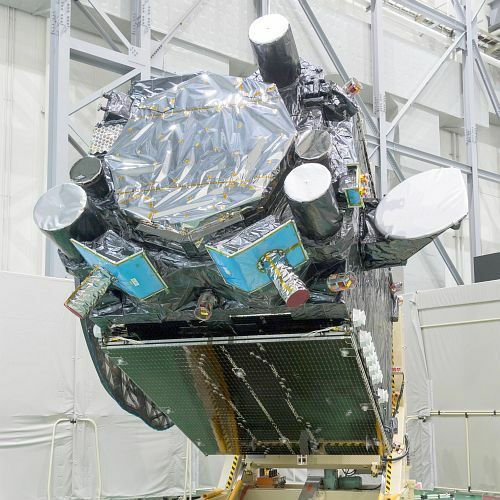 With the concept proven, JAXA ordered three satellites from Mitsubishi Electric for a total of $526 million to establish the operational constellation. Based on the flight-proven DS-2000 satellite platform, QZS-3 stands 5.4 meters tall and weighs 4,700 Kilograms, including 475kg for the navigation payload and 3,000kg of maneuvering propellant. At the heart of the navigation package sits a pair of redundant Rubidium Atomic Clocks that provide the ultra-stable timing needed for the generation of the navigation signal that is transmitted via an L-Band antenna. QZSS delivers navigation signals in the L1, L2 and L5 bands which are processed by ground-based receivers like a typical GPS signal. Augmentation messages are not generated onboard the satellite but on the ground through monitoring of GPS and Galileo signal variability by an array of ground stations across Japan and surrounding regions which detect clock errors and other factors like signal delay caused by changes in Earth’s ionosphere. Correction data for these varying factors is uplinked to the QZS satellite which immediately re-transmits it to any enabled receiver in its footprint that can then apply the corrections to its navigation solution to yield a more accurate location, on average with one-meter accuracy. QZS-3 in GEO provides a constant, large footprint over the Asia-Pacific Region, realizing a broad augmentation service, primarily used for aviation. QZSS delivers the L1-SAIF (Sub-meter class Augmentation with Integrity Function) that is compatible with the U.S. Wide Area Augmentation System, plus an L1-SAIF+ signal that allows receivers to acquire GPS position lock faster and provides space for messages for disaster relief. Additionally, an experimental signal designated L-EX is compatible with the European Galileo satellite constellation coming on line by the end of the decade. Called upon for the launch of the heaviest QZSS member was the H-IIA 204, enlisting the help of two additional boosters to be able to lift the satellite into a highly elliptical orbit. Saturday’s launch was the 35th H-IIA launch since its debut in 2001, the fourth in the 204 configuration and the fourth H-IIA launch of the year – matching the rocket’s previous record for most launches in a calendar year set in 2006 and 2014. QZS-3 had the luxury of a lengthy launch window of nearly eight hours that it ended up not needing as liftoff occurred at the very opening of the window following a clean countdown that started at midnight local time with the rollout of the 53-meter tall H-IIA rocket. Arriving at the pad, H-IIA was hooked up to ground facilities and engineers vacated the danger zone for propellant loading at X-7 hours to fill the two-stage stack with some 120 metric tons of cryogenic propellants, bringing H-IIA’s launch mass to 443 metric tons with the majority of propellants packed into the four Solid Rocket Boosters. Liquid Oxygen and Liquid Hydrogen were kept topped up at flight level while H-IIA underwent complex testing to clear the way for a fast-paced computer-controlled countdown sequence kicking off at X-4.5 minutes to pressurize the rocket’s tanks, switch the launcher to battery power and transition it to flight mode with its own computers in full control. Flames erupted from the base of the rocket at X-5.2 seconds when the LE-7A engine began its carefully controlled ignition sequence, soaring to a thrust of 86,000-Kilogram force and reaching stable operating conditions before the point of no return – ignition of the four boosters. With a thrust just exceeding 1,000 metric-ton force, H-IIA leapt off its ocean-side launch pad – the boosters doing most of the work, delivering 90% of the rocket’s total thrust. 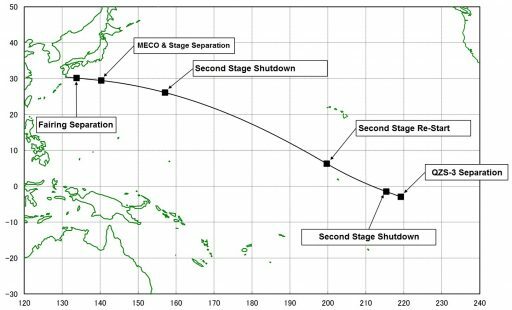 H-IIA climbed vertically for only a few seconds before entering its pitch and roll maneuver to get aligned with a departure path to the south east, headed across the Pacific Ocean on the usual route to Geostationary Transfer Orbit. Burning some 2,550 Kilograms of propellants per second, H-IIA pushed through the sound barrier less than a minute after launch and passed Maximum Dynamic Pressure as it made its way through the dense atmosphere, entering a slight thrust reduction on the boosters to maintain structural limits. Each of the SRB-A4 boosters clustered around the core stage delivered a vacuum thrust of 2,263 Kilonewtons, consuming 66 metric tons of propellant over a burn of 106 seconds to help boost H-IIA’s speed to 2.2 Kilometers per second. Burnout of the boosters was sensed by their declining chamber pressure and H-IIA held onto them for another 20 seconds to ensure safe thrust tail-off and an off-shore impact. 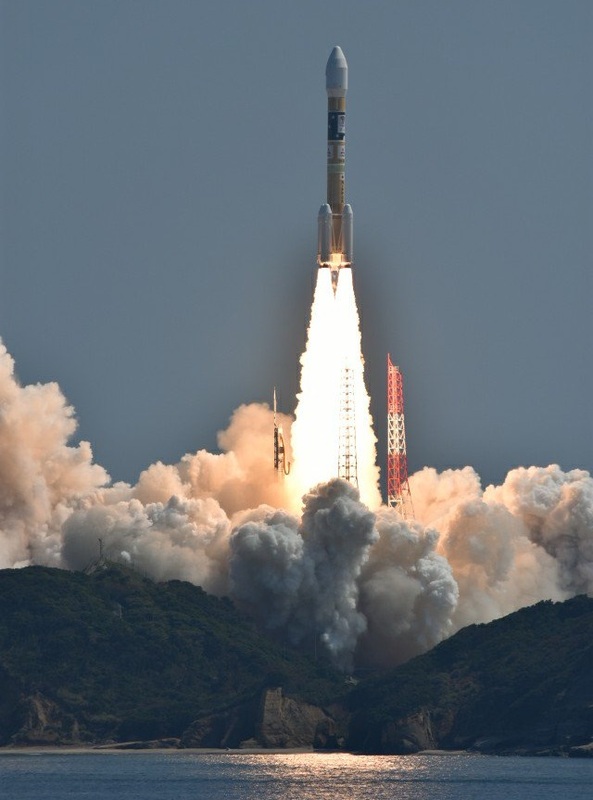 The 15-meter long boosters fell away in pairs at X+2:06 and X+2:09 when H-IIA had reached an altitude of 85 Kilometers – continuing toward space powered by the core stage alone. 37 meters long and 4 meters in diameter, H-IIA’s first stage launched with 103 metric tons of cryogenics on board, consumed by the single LE-7A engine to deliver 109 metric ton-force of thrust when flying through the tenuous upper atmosphere. 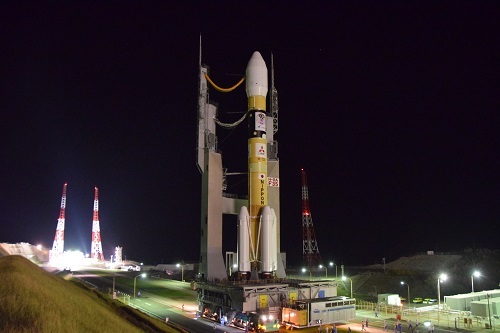 Three minutes and 45 seconds into the flight, H-IIA had reached an altitude of 173 Kilometers and jettisoned its payload fairing to reveal the Michibiki-3 satellite and shed no-longer-needed weight. This flight used the larger 5S type fairing with a five-meter diameter to house the rather large satellite, marking that’s fairing’s come back after over a decade. The first stage finished its role in the flight six minutes and 38 seconds after launch, shutting down its main engine and dropping away eight seconds later after accelerating the rocket to a speed of 5.9 Kilometers per second, lifting it to 270 Kilometers in altitude. Stage 2 promptly ignited its engine six minutes and 52 seconds after launch on a planned four-minute and 31-second burn to inject the stack into a Low Earth Parking Orbit. Generating 13,970 Kilogram-force of thrust, the second stage successfully reached its intended Parking Orbit eleven and a half minutes after liftoff and entered a 12-minute coast phase toward the equator. The LE-5B main engine fired up again 23 minutes and 35 seconds into the mission for a burn of four minutes and nine seconds to significantly lift the apogee of the orbit, targeting a standard Geostationary Transfer Orbit of 380 by 35,976 Kilometers at an inclination of 20 degrees. 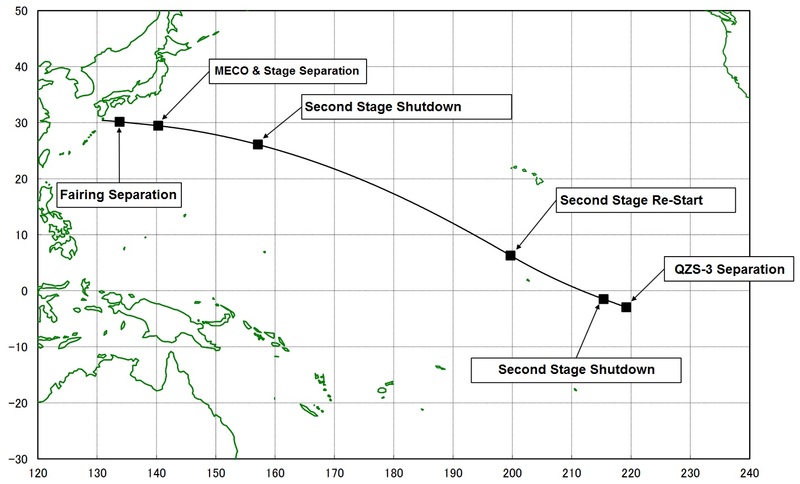 Stage 2 performed admirably and achieved the planned orbit for separation of the QZS-3 satellite 28 minutes and 39 seconds after liftoff, embarking on a multi-burn orbit raising campaign to take up residence in Geostationary Orbit where it can remain locked over the Asia-Pacific Region. 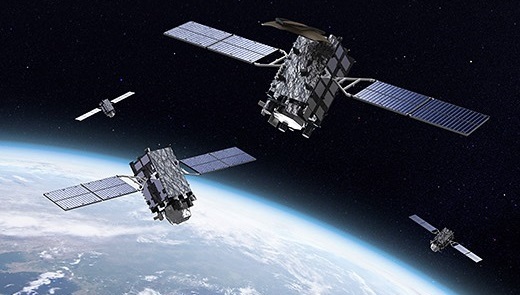 The four-satellite QZSS constellation is expected to be complete by the end of the year with QZS-4 currently looking at a launch target around October, set to join QZS-1 and 2 in Tundra orbit for a final testing campaign before fully operational QZSS services are rolled out around April 2018.